Lita's family, whose home was in Kingsmead Street, had a lucky escape on the Saturday evening, as Lita who was staying with a friend in Newbridge Road recalls. Early on Saturday evening we thought it was Bristol 'having it'. Instead we realised it was Bath. My friend's mother and sisters got into a cupboard under the stairs. My friend and I lay out in the passage with pillows under our heads and waited for it. With every bomb that fell we thought it would be for us. The dresser, filled with china, fell down with such a crash. Pictures fell off the walls, ornaments smashed everywhere. It was dreadful. Come 5.30 am and it seemed we had been spared, so not knowing my mother had gone out and stayed for the evening with her friends (they couldn't have got home with the bombing anyway), I raced home praying they would be O.K. The largest bombs were given nicknames. In Britain, those of 1000Kg or more were often called land mines. The Germans, however gave them names: the 1000Kg was a "Hermann" and the 1800Kg bomb was called "Satan". We all arrived at the same time to find that a land mine had gone off in Kingsmead Street. Our pet spaniel called Roger had been left in the house during the first raid, but miraculously he came out alive. He went to stay with our friends at Camden. Much against the Warden's advice we got back into the rubble and found one room not too badly hit. So we gathered what furniture we could, put it into this room with the intention of sorting it out later. and went away to Camden Road. We need not have bothered, because the next night it was fire bombed so we lost everything. 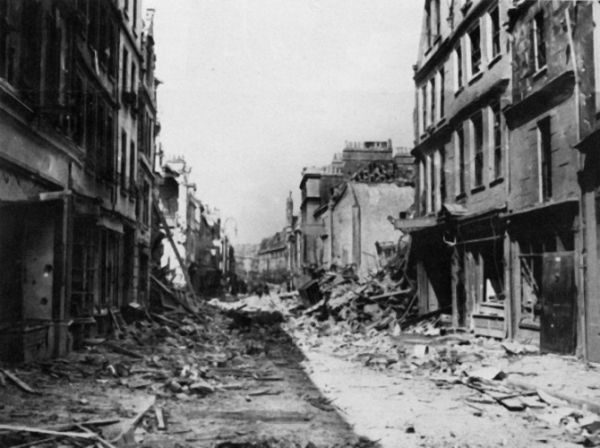 The Kingsmead Street area was very badly bombed on both nights. This is the view looking west. Below is the view looking east. The building on the extreme left of the picture is the Red Lion public house mentioned by Kenneth. In the German wartime archives, there is a map of the area showing potential targets. The name "Bath" is printed on the map in the Kingsmead Street area. 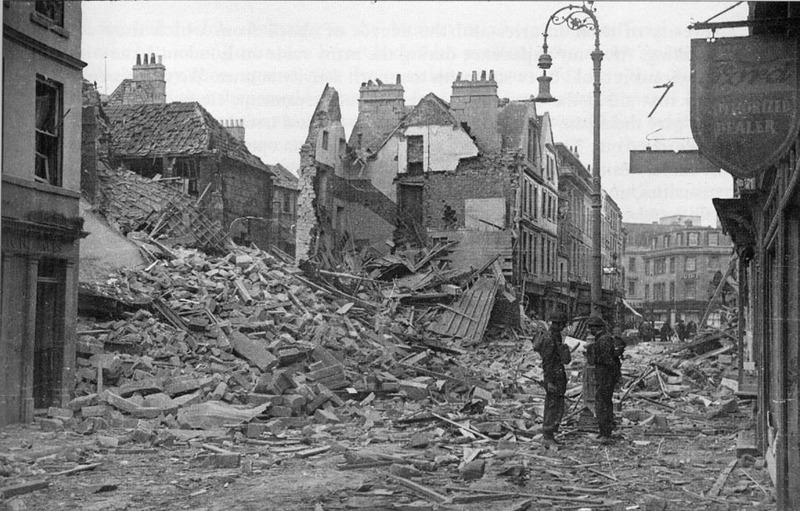 It has been suggested that the pilots who knew that they were bombing Bath concentrated on the location where the name appeared. There is no way of knowing whether this was true though.